Yesterday I posted the announcement of the new WeDo 2.0 set, including some images of models that clearly show there are not only new electronics in the set, but also a new connection system. Today I bring you some high resolution images of those new elements to whet your appetite and as an incentive to further speculation on where this may take us. 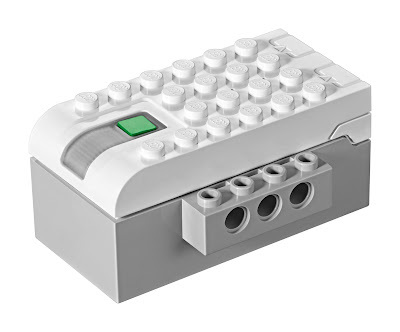 Just in case you didn't read my earlier post on WeDo, what really sparked our imagination is the fact that this new set is marketed as using the Power Functions system, but it is not compatible with the previous WeDo set which uses PF as we all know it. As a matter of fact, the WeDo 2.0 FAQ says these new components belong to the LPF 2.0 system!! So what's in store for us? Let's start off with the hub. 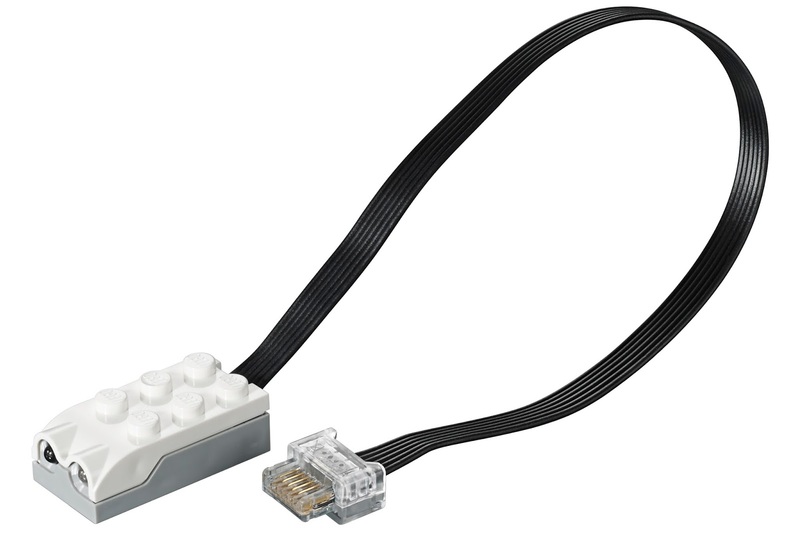 The new WeDo 2.0 hub (part number 45301) consists of two parts. On the one hand there is a space for batteries (2x AA or a rechargeable Li-Po pack - more on this later), the bottom grey part. The white top contains the BLE module which enables the hub to communicate to a computer or tablet (Mac, PC, iPad or Android - Chrome Book will be added to this list in the second half of the year. 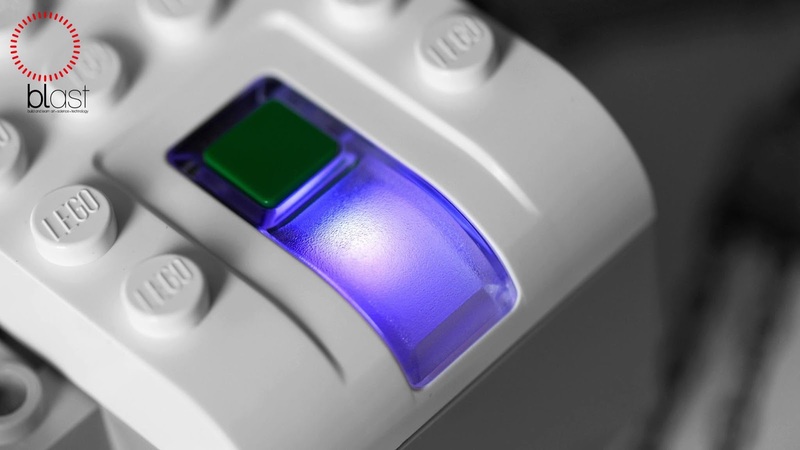 The green spot appears to be the on/off switch, but the transparent area next to it is an RGB led that can be programmed from the software to display 10 different colours: none, pink, purple, blue, sky blue, teal, green, yellow, orange, red, and white. The bottom part comes of to insert the batteries. Off the shelf the hub will be powered with batteries, but LEGO will sell a Lithium Ion Polymer battery back rated 3.7V/900mAh (part number 45302). Compared to the power provided by 2 AA batteries, it sounds like the battery pack will be the more powerful option. Moving to the other side of the hub things get exciting! This is where the cables connect! 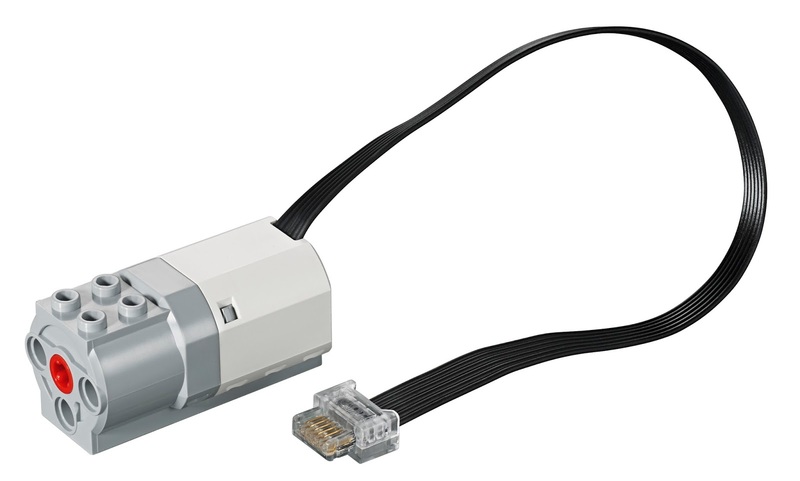 As you cn see the new system is a radical departure from the click-on connectors LEGO have used for decades in 9V and PF1. 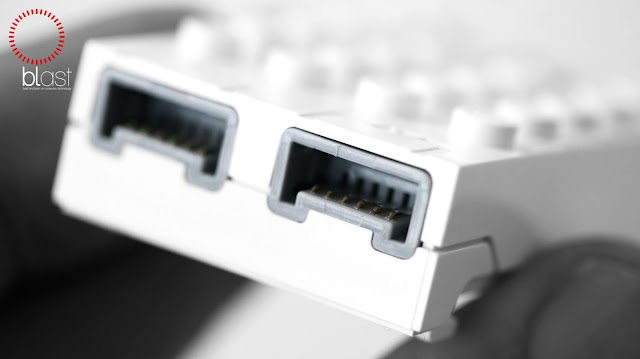 However, the connection system used in the hub is also different from the RJ type connectors used in MINDSTORMS. The plugs enter laterally, but the footprint is significantly smaller, while at the same time using 6 wires for the connections. Shallow sockets with six pins and a very specific form factor! Let's move on to the next element: the motor (part number 45303). Although there are significant changes in the form factor (without even going into the 6-wire cable), the motor is still roughly the same size as the current LPF1 M motor and initial reports appear to confirm that the internal motor is the same as that of the current M motor. New in this iteration are the 4 studs on top of the motor, which will be very welcome in System builds. The flip side of this change s that there are now only 3 connection points around the axle conector at the front of the motor. Including a 4th is not possible because of those new studs. 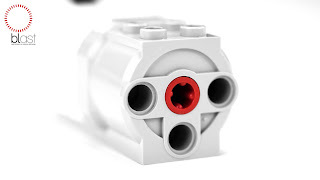 Of course the current drawn by this motor means that LEGO recommends you only connect one motor per hub. 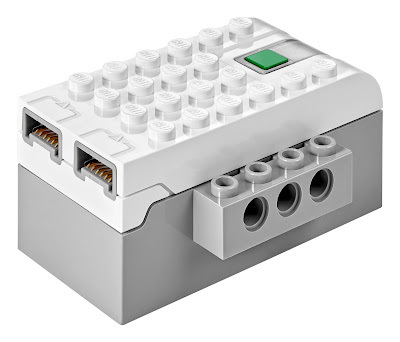 One or two blogs covering the news about the new WeDo 2.0 set talked about the set including a servo, but the information LEGO provides is that this is a "simple" left/right motor. Since the overal size of the motor hasn't changed there would not be space for such an addition either. Next up are the sensors. These are also overhauled versions of the existing WeDo sensors: tilt and motion (proximity). According to the FAQ these have new functionality. In addition to sensing tilt in 4 directions (and of course "no tilt") the tilt sensor now has a new "shake" mode and the motion sensor which detected the presence of an object within its range can now also detect if the object comes closer or moves away. I'm curious to see how this "shake" function is implemented. The other functions were already accessible through programming with Scratch. Last but not least, a shout out to Vassilis Chryssanthakopoulos AKA Nextstorm from blast education for the additional images! Well, I am kind of worried about the guys over at Vengit and their Sbrick. they sure will suffer with the PFv2 not being backwards compatible. And I would find it kind of weird if the Technic 2016H2 sets with the PFv2 and the 2016H1 sets with the PFv1. True only time will tell. 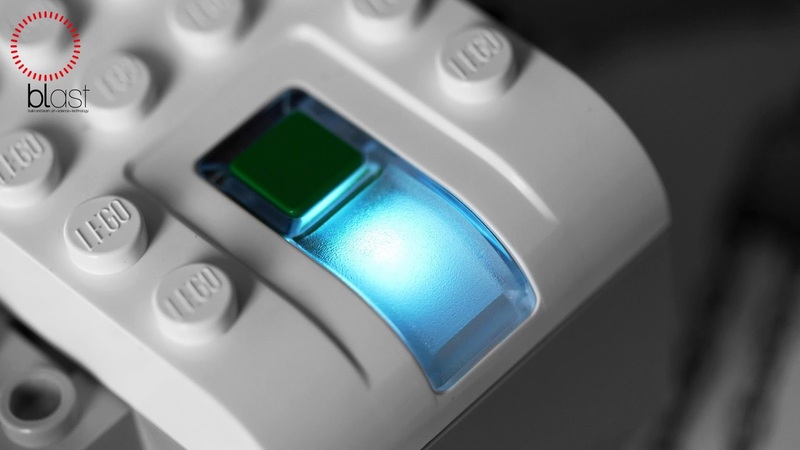 And the FAQ does say that it is a new technology platform "for LEGO Education". And doesn't mention anything other than LEGO Education. 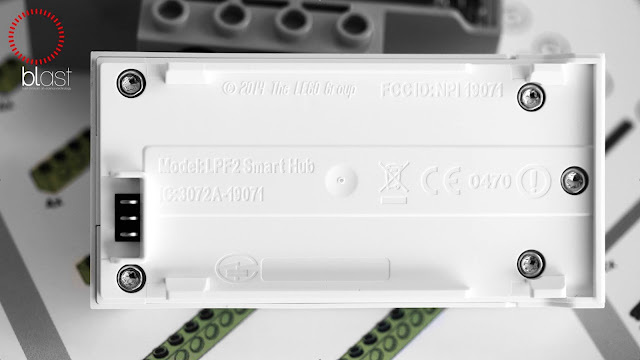 Q: What is the Smarthub 2 I/O? 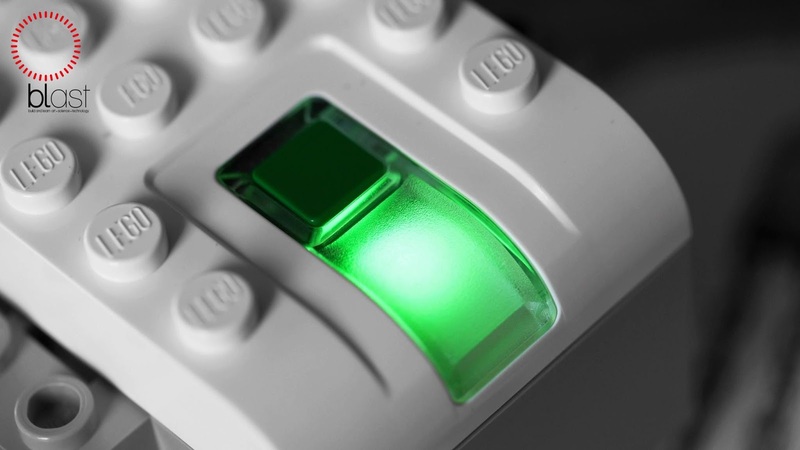 A: An electronic system based building brick that is part of the LEGO Power Functions (LPF) 2.0, a new technology platform for LEGO Education. I see. I hope that transition period is 2017 or before. This really looks neat I would love to see what it could do. I'm thinking that eventually the next generation of Mindstorms and PF will both go to these new connectors. The was much internal strife as the two systems were developed, they couldn't find a middle ground. Six wires is that middle ground. As Tom Said I too think that the next generation of Mindstorm and PF will go together. But who knows who long it will take for the next generation of Mindstorm to arrive, with EV3 being only 3 years old. Upon giving some serious thought about if Technic Power functions converted to the new system, I discovered that we would lose the ability for more than one motor per function on IR or remote connections. This would severely limit our abilities to make our own models without perhaps using 6-8 ports per receiver not no mention that it would mean we have to program our sets. 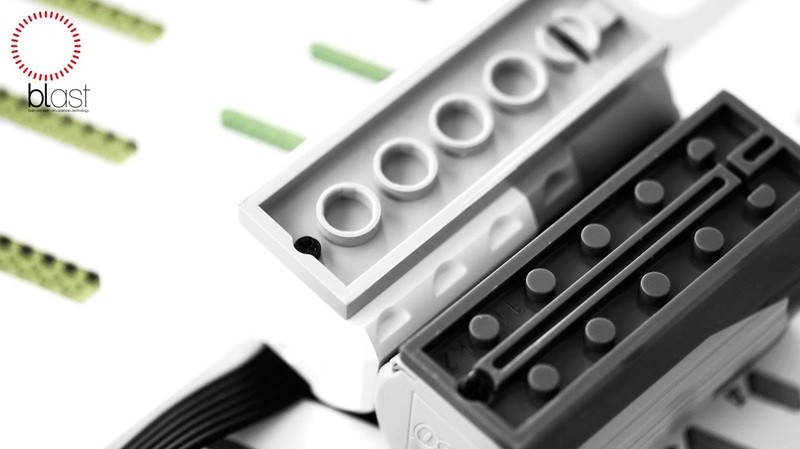 Technic isn't aimed to make programmed models, EV3 is, and so is WeDo. Look at 9398, or 41999, two ports, three motors, two connections to the battery box. 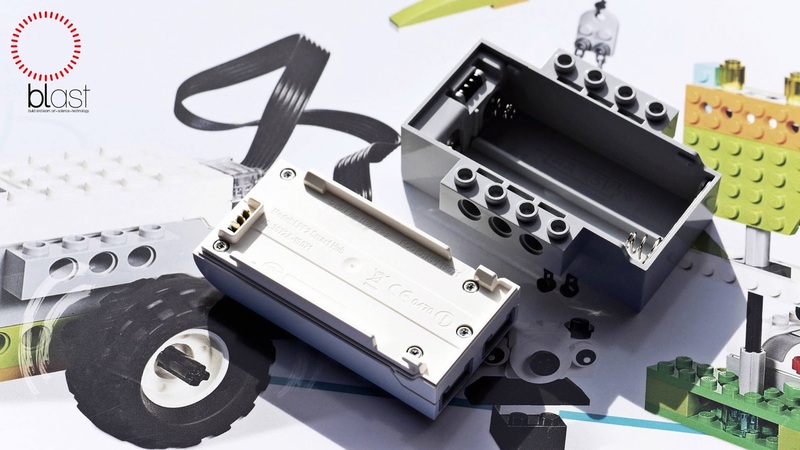 The battery box has to be covered in ports to power multiple functions and so would the IR receiver. 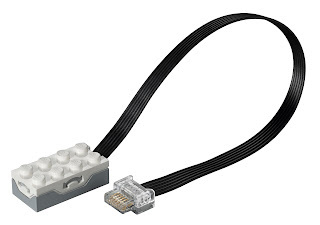 It just makes no sense why Technic PF would use connectors from educational use even though one of the goals of the Technic line is to demonstrate how things work relatively. Using BLE would be the next step after IR. The current IR receivers have 2 channels. Connecting more than 2 IR receivers to a battery box with a single motor to each channel really is the maximum load the battery box can take without affecting performance. If the new (hypothetical) BLE hub has 4 ports the resulting possibilities are the same as what can be achieved now with a single battery box. However, you will no longer be capable of using more than one motor per function without programming and also Bluetooth seems weird to use as not everyone owns a phone capable of using bluetooth or even worse, an app that not everyone can download. The only plausible solution I could see is a port duplicator and a bluetooth remote, but again that would be very costly per element. It seems to me that the new generation should also be able to work with at least 9 Volts. Although Bluetooth is a nice addition, I'm concerned about the number of ports and (possibly) lack of power. Also, studful construction for which the new system looks to be made seems to be a poor choice for Technic. @Menno: The new motor is a 9V motor, but even on WeDo 1 the power provided to that motor was only 5V (the WeDo 1 hub is powered from USB port on a computer). 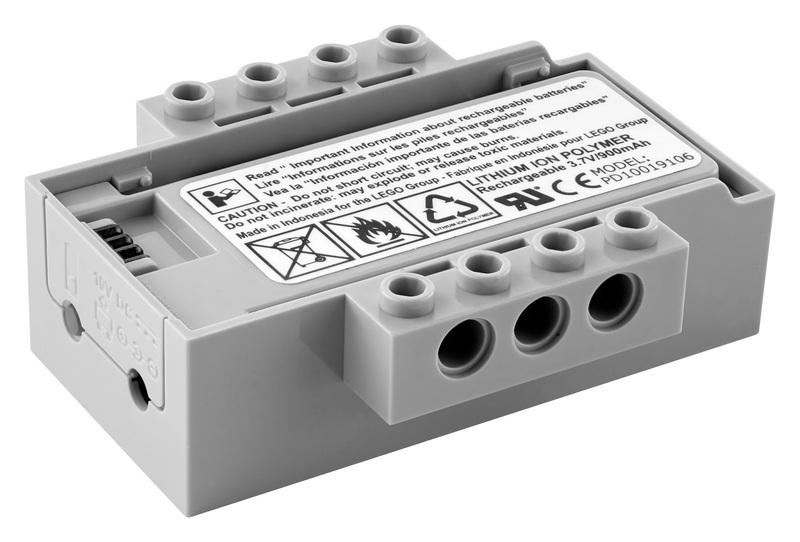 The form factor and manageable size that are required for the specific application in WeDo 2.0 and the fact that only a single motor is ever connected to carry out very simple low power demand functions means that WeDo can "get away with" only 3V (3.7 V with the rechargeable hub). When the system is expanded and included in Technic sets I'm sure it will feature a 9V battery box. @Grejp: Bear in mind the hub was specifically designed for WeDo. Any Technic application of the same protocol will certainly be more Technic compatible. @Jetro: I still don't see why Lego would make a totally new system still as Technic sets should never have a need to be programmed. We have to also keep in mind the older WeDo system used elements that Technic would never use and it brings up the point that WeDo 1.0 used power from a computer and not an individual battery box. It is only called PF because the original WeDo had the medium motor in it. I feel as if we should stop calling it the new pf system and only do so if we know for sure if it is. If the next three waves of Technic sets don't include this form of system, then it probably is only for educational sets alone and the comment referring future elements is most likely they want to add onto the WeDo system like for instance some talk bout a servo motor for WeDo. That is an example of future WeDo PF, not Technic PF. Yea I trust LEGO they know what they are doing. Or at least are fully aware of the consequences of what they are doing. @Kknaut: it's not me proposing this might be extended into other themes' it's LEGO saying this is LPF2 which will be expanded. If it were just for WeDo, the 6 wires make no sense. The sensors and motor it contains and the way those are used could just as easily have been connected with just 2 wires. Something is in the offing. The big questions are what and when. WeDo is never going to include a servo. The set is too basic for that kind of sophistication. Other LEGO Edu offerings (e.g simple machines) require even less specific motor control (off/on is quite enough). So why go through all the trouble of adding wires and opening up possibilities if you don't have the intention of using it to the full somewhere down the road. @Jetro:I hope you are right, but I still think this change wasn't quite necessary... We'll have to wait and see what will become of this. As KKnaut says, I want to see the ability to connect 2 motors to a port, or a port-splitter extension lead. I also want to see a PF1-PF2 interface lead for the transition period. The ten-year change frequency is always a problem for those of us who buy a lot of electric parts. I guess most of the PF1 motors and light, apart from the M-motor, will just have new plugs for PF2. They are all good parts. I would still like an S-motor, like an L-motor with no gearing, for propellers. Currently the train motor is the fastest; 2x PF train motors can get a Ninjago Airjitzu spinner to take off under LiPo electric power, which no other PF motors can. The PF2 plugs look incompatible with other interfaces. 12V plugs were like that, but a multi-plug connection or stacking method is needed. Since WeDo is designed to be simple for kids, it would not need stacking plugs itself but we definitely need them for 2-motor and multi-light models. Either that or the equivalent of the PF1 IR Receiver (PF2 Bluetooth?) would need a tiny switch, as the PF1 pole reverser has, to enable channel 2 to couple to channel 1 for the 2-motor output. I would naturally worry more about the power sources. Yes, the LiPo and AAA battery boxes have a difficult connection with PF1. I had to tell them to move it back from the end so that it would not break on dropping; this made it hard to take the plug off the battery box. For PF2 the plug would enter either into the end (better?) or down into the top (worse?). gain stacking for multiple motors is an issue. 2 sockets on the battery box would be expensive so stacking plugs would be better. What about extension leads? It would need a flying socket, which would be bulkier than the existing PF1 plug, contradicting the aim(?) of reducing plug size. I guess TLG would like to eliminate the short circuit possibilities that still existed with PF1. I suppose it would be PF2 plugs in the EV4(?) so that would also need a transition lead. It would get rid of the "can't find an offset crimp tool" problem for some educators. With 6 wires rather than 4, the cost of PF2 parts will go up compared to PF1, perhaps by £1 for an extension lead. Can't avoid the price of the copper. EV3 leads might be cheaper though. I doubt PF2 would do serial but would it do analogue sensor signals for any purpose, or would it use the extra 2 wires for forward control? I wish the existing PF1 IR Receiver power lead used the C1/C2 pins for remote control, to ignore the IR input and switch the H-bridges as slaves of a master control device. That way infinite motors could be driven from one IR signal (Bluetooth for PF2?). Really hope the slave function is added. I'm quietly hopeful for PF2 but we need to be able to assess the impact on our sizeable collections of electrical parts, in both cost and timescale. Overall TLG needs to realise, via the ambassador route if nothing else, that the announcement of a change to PF2, whether it is 6 months or 3 years, has raised the level of anxiety in the fan community and reduced our confidence in buying PF1 parts for fear of future incompatibility. We need to see good, concrete statements from TLG to define how the transition will enable backward compatibility for all our existing products, which are counted in the hundreds of parts and which we expect to last many years. At least some pictures of interface leads are needed as a first step within about a month please. Don't get too excited- it will be practically useless for powering mocs. Think about it- this system has a power rating of a mere 3.7 volts! The current PF system is 9 volts. Its sole purpose is obviously education applications, and as far as power goes it will be incomparable to the current PF system. "Excited" is not quite the word. "Worried" is more like it. Worried about the obsolescence, not only of the PF1 parts we have, but of the whole ability to apply significant motor power to MOCs. Yes, 3.05V from 2 fresh AAs is piddling, but 3.7V from a single LiPo might not be too bad for WeDo; the no-load speed would be less than with the PF1 5V USB power but the greater current would allow it to retain more speed under load. It's a better solution than using 2x USB ports like a portable DVD drive does. The lower power is safe for kids in the classroom but not so useful to AFOLs. The trouble is, we have not seen anything to give us confidence in the continuation of decent motor power, functionality and connectability with PF2; all we know is it will be rolled out after WeDo. Nothing so far on the stackability of PF2 plugs to drive two motors together. If they do announce an extension cable with 1 plug and 2 sockets then the lack of reversal in the lead direction would be a possible improvement. Just need that press release! Added to that, TLG have removed the small reversing switch from the PF polarity reverse switch. That was an essential feature that allowed the switches to be used as a control panel in a way that allowed "down" to mean something consistent across the panel, such as moving rail points to the curved track. Its removal is just a cost-cutting measure by people who don't understand engineering. This makes for a worrying trend of reducing versatility that is an essential attribute of the LEGO system. This decline needs to be halted fast if the LEGO system is to retain the goodness to create all but the weakest moving models. All the current evidence suggests that TLG have stopped listening to the engineering needs of AFOLs for the PF system. I would be happy to help them if they would value my contribution. I wonder if the PF2 LiPo 45302 could be hacked to make 3 of them produce 11.1V. It might be easier to mount than a single 3rd-party 11.1V LiPo. Then a 3rd party speed controller could give the full 9.15V fresh battery voltage with serious LiPo current for decent motor drives. It would need 1200mA minimum current trip; I've already used more current than that in trains and in flight experiments. @Toby Newell - the fact that WeDo 2.0 uses a 3V setup is in no way a reflection of the capabilities of the LPF 2 system. The WeDo hub needs to be small and manageable in classroom environment and power is not an issue there. The previous WeDo system also used LPF elements (an "M" motor and the possibility to use the LED lights in addition to 2 system specific sensors) at 5V (provided by the USB post of a computer. If (when) LPF2 is rolled out to other themes it will without a doubt use 9V to ensure the necessary power for Technic and other applications.